Directions: On this worksheet you will examine several situations dealing with properties of the refraction of light. Question 1 In a physics olympics event, a semicircular plastic prism is used to direct light to a distant target on the wall. The prism has an index of refraction of n = 1.44 for red light and an index of refraction of n = 1.64 for green light. If a red beam strikes a streen L = 1.32 meters away at a position y = 0.22 meters above the central line, at what angle did the beam originally enter the prism? Question 3 A light ray enters a rectangular piece of glass along the path shown in the following diagram. 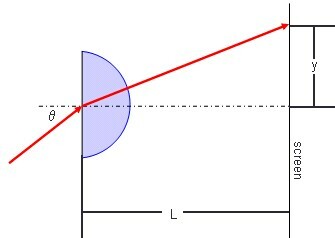 If q1 = 32º and q2 = 53º at point A, then determine which of the following options will occur when the beam strikes point B. Question 4 When surrounded by air, a beam of blue light normal to the hypotenuse of a 45-45-90 prism in internally reflected so as to bounce back out in the reverse direction from which it entered. 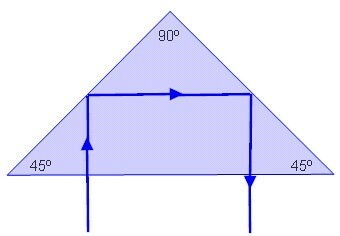 What is the index of refraction of the material composing the prism? 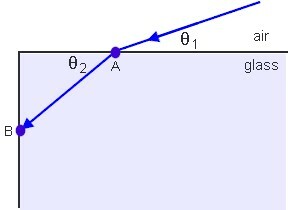 Question 5 If the prism in Question #4 were to be submerged in a liquid having an index of n = 1.34, what would happen when the beam arrives at the first diagonal interface?